The NFYFC Youth Forum has received recognition for its development of the 'Watch That Cowpat!' game, by picking up a top Award. The Youth Forum came up with the idea of 'Watch that Cowpat!' last year and received funding of £500 for their project. 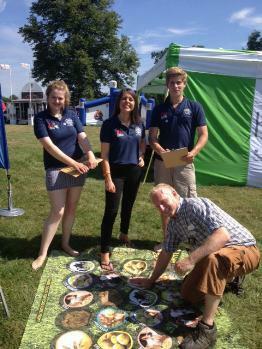 The game, which is supported by the Rural Youth Trust, encourages participants to make connections between products that we see on supermarket shelves and their source on the farm, through a spinner board, which lists food products, and the player connecting this to its respective source on the floor mat. Their efforts were rewarded last week when they picked up a NCVYS (National Council for Voluntary Youth Services) Action Squad Award. The NCVYS Action Squad Awards 2015 aim to showcase and celebrate good practice amongst social action teams that have made a positive and lasting impact on their environment. Nominees were invited to attend the Shaping Social Action Conference on March 25 2015 where the winners were announced. Former chairman, Sioned Davies, spoke on behalf of the Youth Forum at the Conference and helped the team win an additional £500 for being the best action squad. Sioned tweeted: "@NFYFC @NCVYS thanks so much for the opportunity! It was a good session and we had lots of interest!" Meanwhile, Butsfield YFC also won an Action Squad award and received £500 for completing their youth social action project. The club, from County Durham, cleaned up a nature reserve for the benefit of their local church in the village of Satley that would benefit the whole village. Kate Tomlinson, from Butsfield YFC, said: "We spent a really good day improving a nature reserve behind a church in our local area, putting on new gates, clearing the whole area, putting down a new path etc. Everyone who took part (about 22 of us) had a great time". Learn more about the NFYFC Youth Forum here.